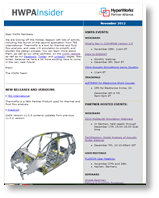 The HyperWorks Insider features CAE technology and industry trends as well as the latest software news, tips & tricks, events, webinars and more. Interested in HyperWorks events and training? 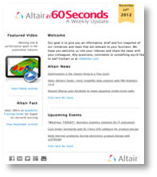 Subscribe now to receive weekly event invitations and training updates. Our goal is to give you an informative, brief and fun snapshot of our initiatives and news that are relevant to your business. The Partner Alliance is ever growing with new partners and members. Subscribe to our monthly newsletter to learn about our latest partners, training, news, and more.